Bottom...Last kilometre goods delivery vehicle. Hoooray for the Hooomans! Great captures, both! Ray: Thank you, Elizabeth. Highlights to me how physically inept we First World Citizens have become in the last 150 years. Pour la première photo, on peut dire que ce sont les transports en commun. Ray: Certainement ... une sorte de taxi, Martine. Ray: They probably don't need to spend a lot of time in gym after their day of work, Lisl. Ray: The fare would be miniscule, Chris, but I suppose he makes enough in a day to keep himself going. Très courageuses ces personnes pour survivre ..
Ray: Pour les très pauvres, la vie est un défi dans la plupart des endroits, Claudine. For the very poor, Life is a challenge in most places, Claudine. I would feel on.iged to help push, like we used to all the time with cars that would not start. Ray: These blokes know what they are doing, Chad, so better to let them get on with it. Must be a well-to-do family. I expect Pops has told them to work hard at school or else they will end up pulling rickshaws. Is the bike in the other image being bump-started? Ray: I expect this rickshaw operator has a running contract to deliver the kids to and from school, and that might be his best fare each day. In the bottom image, the guys are pushing because their load is simple too much to be moved by pedal power...the bike is being used as a cart. clear the vehicle in the top shot still survives (i was under the impression it was banned), Ray. the one in the second shot is quite versatile in its applications. 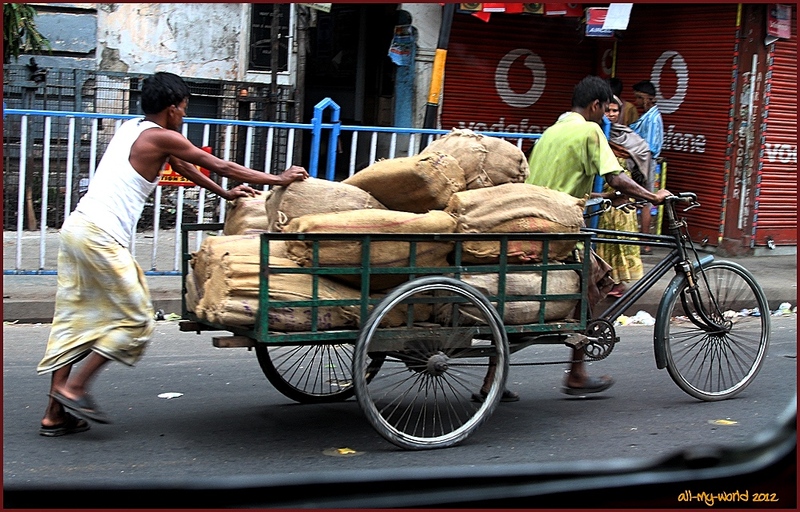 Ray: My impression is that the rickshaws had found a place in the backstreets and residential areas of the city, Ayush. As to the trike...an extremely popular short haul vehicle...cheap, reliable and versatile. A bit strange world in our European eyes: the kids are transported to school by the young man - did he ever visit a school? I admire those hard- working men. Ray: Asia is like another World, Philine, and India is like another World within Asia. Human Powered vehicles will be seen quite a lot in this series. There's no doubting that these people earn their money by sheer hard work. Ray: There is not much of a Social Security net in India [or most other parts of Asia], Brian, so the poor must find work or they will not survive. Ray: I think your assertion is abundantly clear in India, Bill. Ray: I had to pause to consider your use of the expression "ad hoc", Tom. My sense is that the vehicle in the bottom picture is more "general utility" than "ad hoc".